krpano uses simple xml text files for storing the settings for the krpano viewer. These files can be written or edited with any usual texteditor, but when writting the xml code, it is important that the xml-syntax-rules will be respected! The documentation is split into normal and advanced parts. This is only for better readability and more clearness. The more advanced settings and tags are hidden by default and can be shown (or hidden) by pressing the show / hide advanced settings button withhin each part of the documentation. When a xml element has a name attribute, then this element will be interpreted as element of an array. This means there can be more elements of that xml element, where each element need to have its own unique name for identification. The name of the array will be the name of the xml element. Each name need to begin with an alphabetic character! When a name still begins with a numeric character, then the name will be interpreted as array index. This is okay for dynamic index-based read access inside actions but not for defining elements! All names will be converted automatically to lower case to allow case insensitive access! The devices attribute defines if the given xml element and all its sub/children elements should be used or skipped on a given device. The resolving of the devices attributes happens during the xml loading and parsing. The value of the devices attribute can be one or more of the available devices strings. Note - for checking for the devices settings dynamically in actions code, use the device object and the if() or resolvecondition() actions. Note - desktop, mobile and tablet are 'tri-state' settings, they can never be set at the same time, only one of these can be set. By adding a dot . character at the end of an attribute name and then there the names of one or more devices settings, it is possible to define that attribute only for that given devices. All the same devices as in the devices attribute can be used for the device checks. The <include> elements can be used to load and include other xml files. Before the krpano viewer will start to parse and resolve a xml file, it searches the xml for all include elements. And when a include element will be found, then the given xml will be loaded and the content of the loaded xml file will insert in the current xml file by and replacing the include element. During this include loading and resolving process,the url attributes in the included xml files will be adjusted. See the notes about the url attribute for more details. When all includes were loaded and resolved, then the main xml parsing starts. These are special elements, their content will be ignored during the xml parsing. Their whole content will be stored as string in the content variable of these elements. An url attribute in any xml element will be handled in krpano in a special way. When a relative path is used as url value, it will be relative to the xml file, where the url attribute was defined. This is also true for included xml files. That means relative paths in an included xml are relative to the included xml file itself and not to the main/root xml file. Note - when setting / changing the url attribute dynamically, then there is no automatic relation to the xml file paths anymore! %SWFPATH% - Path of the swf file. %$VARIABLE% - Use the value of the given 'VARIABLE' - this can be any krpano variable, but it must be defined before the current xml or scene will be loaded, e.g. already in the html file or before loadpano(), loadscene() calls. The time in seconds without any user interaction before calling the idle event. Should the debug trace messages from krpano or from plugins be shown. The <include> elements will be resolved during the xml loading. The <include> element in the current xml will be replaced with the loaded content of the included xml file. Once all include elements are resolved, the viewer will start to parse the loaded xml data and convert / map it to the runtime data structures. The url / path of the xml file that should be included. Relative urls path will be automatically adjusted to be relative to the xml file in which they will be defined. See also the notes about the url attribute for more details. Internal rendering tessellation details, a higher details value will result in a more detailed internal 3D-geometry. When using the Flashplayer 10 and cubical images without any distortion (fisheye, stereographic, ...) then this setting will be ignored, because a tessellation will be no necessary. A cubical panoramic image as 'imagestrip' in one single image. Supported image orders are 6x1, 1x6, 3x2 or 2x3. The assignment from the cube side to image can be done with the strip settings. Define the paths / urls for a cubical pano image. The path should contain a %s placeholder for the cube side (l,f,r,b,u,d). Define the paths / urls for the cubeface images. For cubestrip panos - define which image part / strip of the cubestrip is the image for the cubeface. Rotate a cube side in degrees. Can be used for cube images in non krpano default configurations. Flip / mirror the image along the X and/or Y axis. Possible values: "X" or "Y" or "XY" or "", default=""
Define the path / url for a cubestrip image. Define the path / url for a spherical or partial spherical pano image. Define the path / url for a cylindrical or partial cylindrical pano image. Defines if the all tiles from that level should be downloaded and decoded or only the onces that were currently need for viewing. Possible values: "all", "view" or "auto"
all - all tiles from that level will be loaded. view - only the tiles that are needed for the current view will be downloaded. auto - when the level size is lower then 10 megapixel (=width*height < 10mp) then "all" tiles will be loaded, otherwise only the "view" tiles. This setting will overrule the default display.details setting. Define the paths / urls for the cube face images for this level. Define the path / url for a spherical or partial spherical pano image for this level. Define the path / url for a cylindrical or partial cylindrical pano image for this level. When using multi-resolution images, then the urls / paths must contain placeholders for the tile index. The tile index number itself starts with the baseindex. Each placeholder can be used a several times in the url, e.g. as part of the file-name and also as part of the folder-name. The index numbers can be additionally formated by putting one or more 0 characters between the % and the placeholder character - each 0 will increase the 0 padding of the index number. The view element contains the information about the current view. In the xml it can be used to set the startup view settings. This value contolls the interpolation between the normal rectiliniear view and the fisheye distorted view. (0.0 - 3.0), 0=linear correlation, 3=dynamic correlation) - default="0.5"
Display settings for adjusting rendering quality and performance. * HIGHSHARP: after rendering the pano in HIGH quality, the image will be additionally postprocessed with a 1 pixel unsharp-mask filter, this setting needs a lot of processing power so it should be only used for stillquality. On mobile and tablet devices the mobile/tablet images will be used by default. But with the usedesktopimages setting, it is possible to tell the viewer to use the desktop images also on these devices. 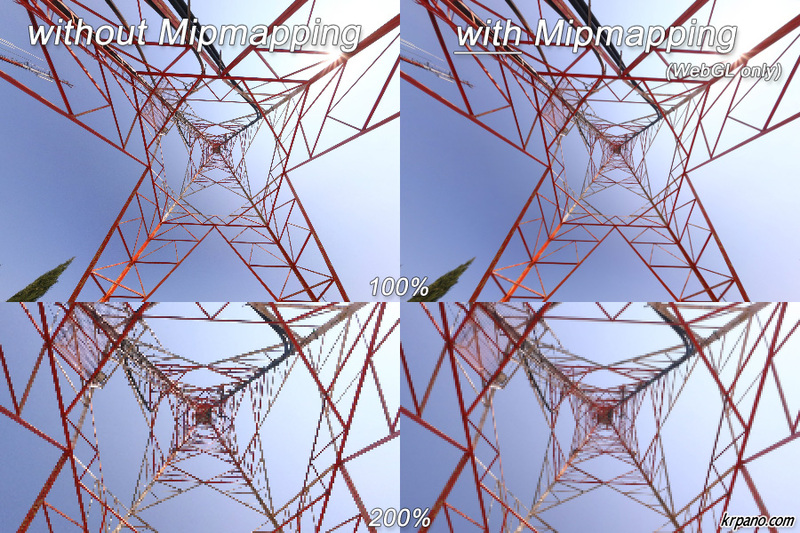 Technically mipmapping is only possible for images that have power-of-two sizes. Note - when the krpano viewer shouldn't capture the mouse wheel usage over the viewer (e.g. to allow scrolling the webpage instead of zooming the pano), then have also a look at the mwheel embedding setting. Allowed user control modes: "all" or "keyb" or "mouse" or "off"
Note - in the Android Flashplayer the drag2dsmooth mode was automatically used when using drag2d to improve the visual response. When enabled and zooming in by the mousewheel the pano will zoom toward the position of the mouse cursor. When zoomtocursor and this setting are enabled and zooming out by the mousewheel the pano will zoom away from the position of the mouse cursor. Otherwise the pano will zoom away from the center of the screen. The acceleration of the mouse controlled moving. The maximum moving speed of the mouse controlled moving. The moving friction of the mouse controlled moves. An additionally friction for the vertical movement in the moveto control mode. Can be used, with values lower than 1.0, to make the vertical moving less responsive. The mouse wheel fov (zoom) change in degrees (=mouse wheel zoom sensibility). The moving friction of the keyboard / button controlled moves. Invert keyboard / button up and down moves. The maximum fov change / zooming speed. The friction of fov changes / zoomings. Enable a direction cursor for the "moveto" mousetype. Note - it also possible to define custom mouse cursors with the <cursors> settings. Size of the movetocursor cursor. Swing / tilt the head / view when fast moving left or right (moveto mode only). This value sets the strength of this effect, from 0 to 10 and higher. Should the roll of the camera (view.camroll) be reset back to horizont when moving in the moveto or drag2d mode. The moving friction for touch controls (iPhone/iPad/Android). It's possible to use one single image that contains all different mouse states image, this reduces the necessary download requests and speed up loading. The individual images will be selected by defining the crop pixel coordinates for them. Automatic rotation / moving / zooming when there is no user-interaction in the pano. Note - the <layer> or <plugin> elements are internally exactly the same elements, only with different names! Supported file types: SWF, JPG, PNG, GIF. An 'alternative' path/url for the layer / plugin image file for the krpano HTML5 viewer. When setting the alturl setting, the normal url setting will be overwritten in the HTML5 viewer - that means, declare the alturl always after the url setting. This can be used to use an alternative image, e.g. an animated gif instead of an animated flash. Supported file types: JPG, PNG, GIF and Animated GIF. Note - the alturl setting should be used only in the static-xml-code! should be used to set different urls. An action of the layer / plugin element to load interactively settings from a <style> tag. image - the default and only allowed value! Note - when "url" will be set, the hotspot will be an image hotspot! An 'alternative' path/url for the hotspot image file for the krpano HTML5 viewer. When setting the alturl setting, the normal url setting will be overwritten in the HTML5 viewer - that means, declare the alturl always after the url setting. This can be used to use an alternative image, e.g. an animated gif instead of an animated flash. Note - for rendering performance reasons the mask shoudn't not be used with distorted hotspots! Apply bitmap effects to the hotspot image. Actionscript 3 Loader object of the loaded hotspot image. Actionscript 3 Sprite object of the hotspot. An action of the hotspot element to load interactively settings from a <style> tag. A storage / collection element of attributes for layer / plugin or hotspot elements. When a layer / plugin or hotspot has its style attribute set to the name of a style element, then all attributes from that style tag will be copied / set to the layer / plugin / hotspot element. But note - this coping will be done only once during the creating of the layer / plugin / hotspot element - or - dynamically when calling the loadstyle() action. The count / number of all <style> elements. The numeric index of the style element. When a name attribute will be defined then this events element will be an independent local events element. Without name attribute the global events were set. Should this named events element be kept or removed when loading a new pano. This event will be called when the loading of the xml file or the xml code of scene was done. After this event the pano-viewing and the loading of the pano images will start. This event will be called when the loading of the preview images was done. This event will be called when the loading of the pano image is done. When using multi-resolution images, then this event will be called once when all parts for the current-view were loaded completely. This event will be called when the current pano will be removed (e.g. before loading a new pano). This event will be called when there is a loading error. When this event is set, no error will be shown from krpano itself. They keycode of the pressed key is stored in the keycode variable. They keycode of the released key is stored in the keycode variable. This event will be called when there is a mouse click in the pano. This event will be called when the mouse button is pressed down in the pano. This event will be called when the pressed mouse button is released. This event will be called when the mouse wheel was used. The delta of the mouse wheel usage will be stored in the wheeldelta and wheeldelta_raw variables. On touch devices there is no mouse-wheel, but this event will be called too when using the 2-finger zooming gesture. The wheeldelta variables will be set to positive or negative values depending if zooming in or out. The wheeldelta_touchscale variable will provide more detailed information about the gesture zooming in this case. This event will be called after idletime seconds without user interaction. This event will be called every time when the current view was changed but before final rendering. That means changing the view itself before final rendering is possible here. This event will be called every time when the current view was changed and rendered. This event will be called when the screen/window or the area size has changed. The new screen size is stored in the stagewidth and stageheight variables. Define a krpano action - this is like a function or procedure in other scripting or programming languages. Inside an action xml element itself, a sequence of action calls can be placed. The action calls will be executed one after the other. This makes it possible to implement special limited external interfaces. The content of the action tag. This can also be set or changed dynamicallly. Note - when loading a other xml file, all actions remain unchanged unless they are defined again in the other xml, then they will be overwritten by the new ones. When calling an action it's possible to pass parameters to it. Use quotes like 'parameter' or "parameter" to mark everything between the quotes as a 'connected string'. This also allows the usage of commas (,) and blanks inside a parameter. Here a condition like in an if() action can be used. Settings for the visualization of the loading progress. auto means none for multi-resolution panos and bar() for normal panos. width = width of progressbar in pixels (if you add a "%" to value its a percent value of the screenwidth), default="200"
height = height of progressbar (height% = percent of screenheight), default="10"
offsetx = x-distance from origin (offsetx% = percent of screenheight), default="0"
offsety = y-distance from origin (offsety% = percent of screenheight), default="50"
style = "solid" or "shaded", default="shaded"
auto means none for multi-resolution panos and loopings() for normal panos. Note - when defined/set - then the xpos/ypos values will be pixel values! A setting for multi-resolutions panos - should the loading bar be shown again when starting to load new tiles. By default the progress animations were shown inside the pano area. To show the animations at the Flashplayer 'Stage' level use parent="STAGE". The current loading progress as linear value from 0.00 to 1.00. Can be used to create custom loading animations. Use the onxmlcomplete event for starting the loading animation, and the onloadcomplete event for stopping. A boolean value that indicates that the viewer is currently loading the pano. A boolean value that will be set when the loading of the pano was done. A boolean value that indicates that the viewer is currently blending the pano. 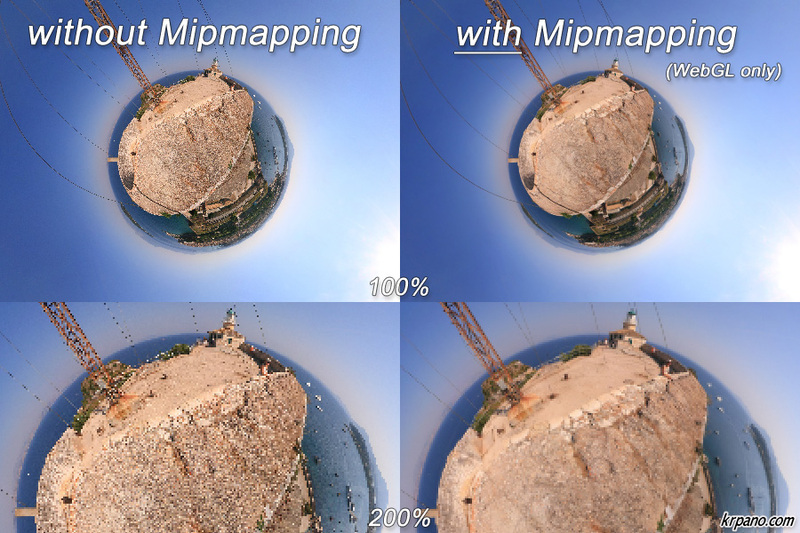 A boolean value that will be set when the blending of the pano was done. A boolean value that will be set when the loading of the preview pano was done. The number of current loaded bytes (not usable for multi-resoltions panos). The number of current total loaded bytes, this can be adjust step by step when the size information of the new files become available (not usable for multi-resoltions panos). Network settings for downloading / decoding and caching images. The number of images (tiles) that will be downloaded at the same time (0=automatic). The number of images (tiles) that will be decoded (jpeg ⇒ pixels) at the same time (0=automatic). WARNING - don't use high values here, the decoding is very heavy processing operation, and unfortunatly the Flashplayer can't decode in 'background' so during decoding the viewer will be blocked! Enable/disable the caching of all other (not pano image related, e.g. layer / plugin and hotspot) files. The size of the cache buffer in MB. With textstyle elements it is possible to define styles for texts that will be shown with the showtext() action. The name of the textstyle need to be passed there as 2. parameter. The count / number of all textstyle elements. This is 1 by default because this is a predefined DEFAULT element. The name of the textstyle (see the name notes). Use DEFAULT as name to overwrite the default textstyle settings. The index of the current textstyle element. The point size of the text. Specifies whether the text is boldface. Indicates whether text is italicized. The default color of the text in a text field. The alpha (transparency) value (0.0 - 1.0) of the text. Origin position of the text. Possible settings: cursor - display the text at the position of mouse cursor or lefttop, left, leftbottom, top, center, bottom, righttop, right, rightbottom. Edge/origin positon on the text itself. Align of the text: none, left, center, right. The x offset in pixels from the origin point to the text. The y offset in pixels from the origin point to the text. The time to the show the text in seconds. The fade out time in seconds. The fade in time in seconds. Avoid the clipping of text on screen borders.